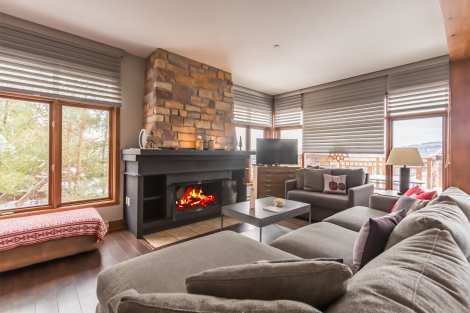 Mont-Tremblant Altitude 172-4 Condo for Rent | Book Now! Gorgeous, professionally decorated unit righton the slopes. Every square foot was carefully thought out for optimal comfort.Right as you walk in, the entrance is practical, with plenty of space for coatsand equipment. Next is the spacious main area, which includes a modern,functional kitchen with bar-style counter, a pretty dining table and the livingroom with a cushy, oversized sofa you’ll want to sink into after a fun day out.With a wood-burning fireplace warming the space and many windows letting in aflood of natural light, it’s the perfect spot to relax and unwind. There aretwo bedrooms, one with a king-size bed and the other with a queen-size bed. Thetwo bathrooms each have a bathtub and shower. The deck, with private hot tub,BBQ and outdoor furniture, offers a splendid view of the lake and pedestrianvillage. The unit is air-conditioned and has heated tile floors. Two TVs, a DVDplayer, an iPod-compatible compact sound system and high-speed internet provideadditional entertainment options. What a joy to stay in this exceptional unit!